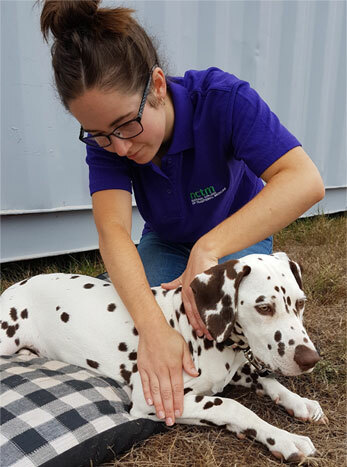 We invite dog owners to make an appointment and bring along their dog (s) to receive a FREE DOG MASSAGE as a part of our fully supervised Canine Myofunctional Therapy ‘hands-on’ practical weeks. Our college hold these clinics about 4-6 times a year and they are currently being held in Daylesford, Victoria. Appointments must BE MADE, notifications of our Free Dog Massage Days are listed here and on our Facebook page and we welcome all enquiries. We have a wonderful data base of regular attendees that we are forever grateful to their attendance and we look forward to seeing them. At some of our clinics over 5 days our students have massaged up to 120 dogs. If you would like to be included on our Free Dog Massage notifications email list please contact us. Once again, we welcome all enquiries, please don’t hesitate to contact us.